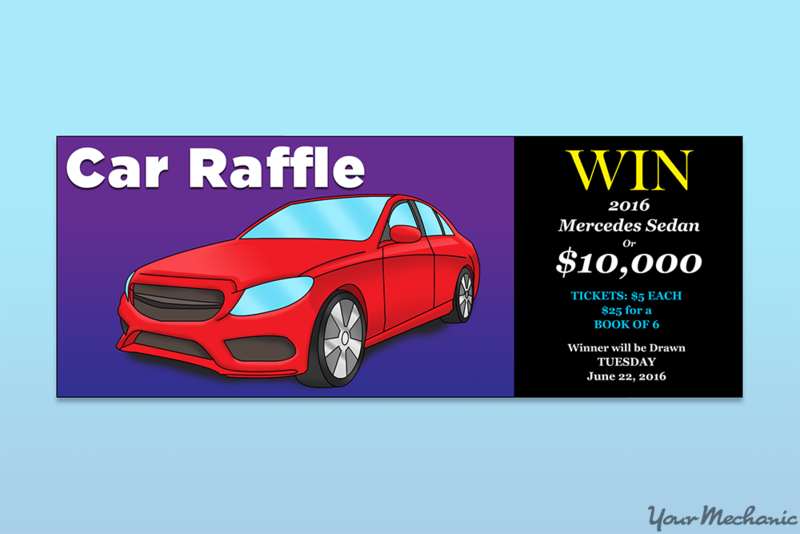 A popular way to raise money for a charity, school, or nonprofit is to raffle a vehicle. This type of raffle can draw in large crowds interested in the vehicle up for grabs. Before giving away a vehicle, though, you need to take a few things into consideration, including finding a nice vehicle to raffle, determining how much you want to make off of the raffle, and promoting the raffle to increase raffle ticket sales. The first step you need to take when setting up a car to raffle is to find the vehicle for the raffle. You also need to consider what type of car you want to give away. Some of the different options to consider include a luxury, sport, compact, or other type of vehicle. Tip: You should also include additional prizes in the raffle. While these prizes will go for a lesser value, they can serve as nice consolation prizes. These type of prizes can include gift cards, vacation stays, or even car-related items. Step 1: Determine the type of car you want to raffle off. 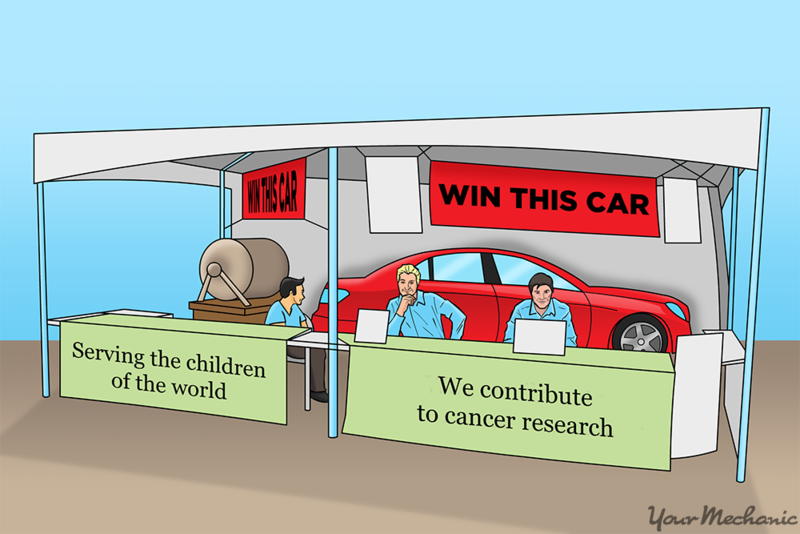 Think about what type of vehicle would provide the biggest draw for raffle ticket sales. Step 2: Ask dealerships for donations. Approach businesses and organizations that you think might be interested in working with you. Many car dealerships might be willing to donate a vehicle if the money is going to a worthy cause. In addition to the free advertising that the publicity from such an event generates, you can also offer to give them a portion of the profits from the raffle as an additional incentive. Step 3: Look for a private donor. Another option is to look for someone with the type of vehicle you are looking for who has an interest in donating it for a worthy cause. While private individuals do not necessarily need the exposure that a donation brings, philanthropists tend to donate money and items for charity with more altruistic goals in mind, including the joy of helping others. Warning: One thing to keep in mind when searching for a vehicle for a raffle are the taxes involved, if any. 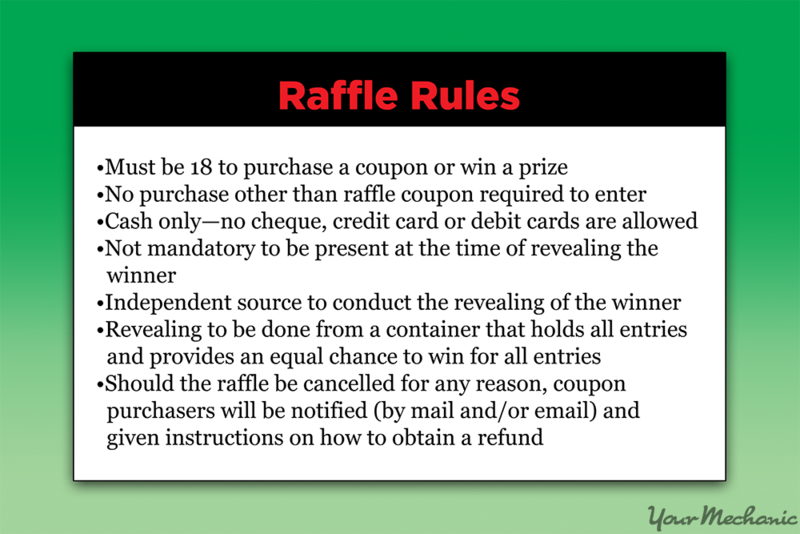 Depending on the status of your organization and whether you pay your workers or if they are only volunteers determines if your raffle is tax exempt. It is best to check with an accountant or your Secretary of State's office to make sure you cover all of your bases in regard to taxes. Once you have a vehicle to raffle, you need to determine the price of your raffle tickets. You want to make roughly three times what the vehicle is worth. This should give you enough wiggle room to cover any additional expenses, pay for any additional prizes, and make a profit, just in case you do not sell all of your tickets. Step 1: Determine ticket price. 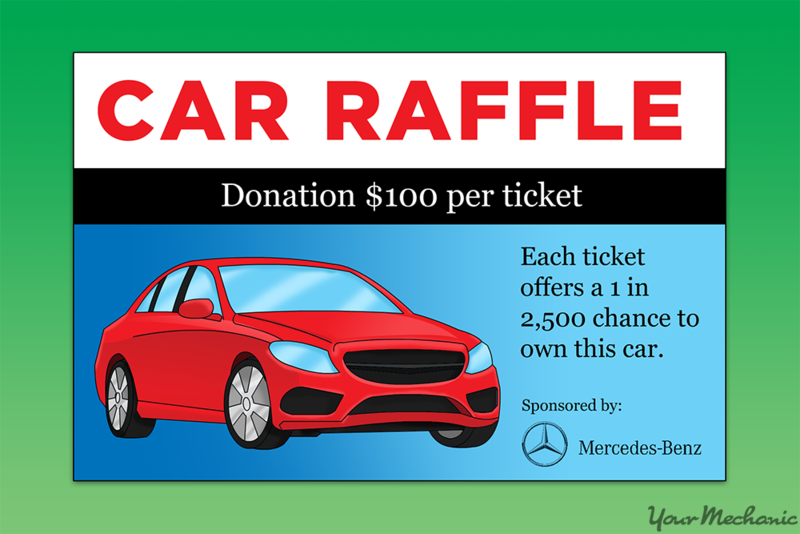 To figure how much you want to sell your raffle tickets for, multiply the worth of the vehicle by three and then divide that amount by the number of tickets you expect to offer. Keep in mind that lower-priced tickets should sell more, but you don't want them to be too low that you end up losing money on the raffle. The provider of the vehicle. The price for the raffle ticket. Promoting your raffle is as important as selling tickets. Without sufficient promotion, you can expect to sell fewer raffle tickets and make less money. Before selling the first ticket, you should develop a strategy about where and how you want to promote your raffle to potential ticket buyers. Step 1: Determine promotion locations. Contact some local businesses to see if they will allow you to set up a booth outside of their locations. Make sure to explain what charity the raffle proceeds will go to. Step 2: Schedule a promotion time. If a business agrees to let you promote the raffle at their location, schedule a date and time to set up your booth. Make sure to get others to agree to schedule time to man the booth in addition to yourself. Tip: Make sure to advertise what your raffle is for, both the charity or organization, and the prize involved. Also, make sure to design and print large signs to get the attention of passing shoppers. Step 3: Spread the word. Some other promotional ideas include taking out ads in the local paper, handing out flyers, or advertising on local radio and television. Additionally, have your volunteers tell all of their family, friends, neighbors, and co-workers about the raffle and the great cause it supports. Tip: To help sell more raffle tickets, develop a sales pitch or two to make the purchase of tickets more appealing. Make sure to include the cause, the prize being given away, and any secondary prizes up for raffle. Once you have spread the word, it is time to sell your tickets. Hopefully, your promotion of the raffle was strong enough to inspire those in the local area to buy tickets. Step 1: Send out your volunteers to canvas the local area. The more volunteers the better. Hopefully, they spread the word to their family, friends, and coworkers, increasing their sales even more. Step 2: Set up your sales tables as agreed at local businesses. Using your sales pitch, sell to shoppers and passersby. You might even consider displaying the vehicle up for raffle, if possible. After selling as many tickets as you can, it is time to hold the raffle. 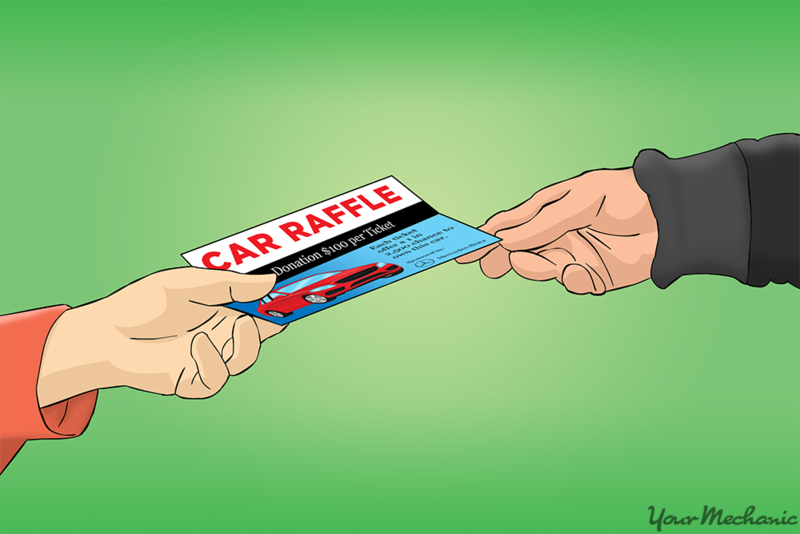 Usually held at a large location, such as at the dealership that provided the vehicle, the raffle drawing should be a big event. You can even invite local celebrities to participate and invite local media to cover the event. You should also provide plenty of entertainment to fill in the time when you are not drawing tickets, including live music and free or low-cost food. 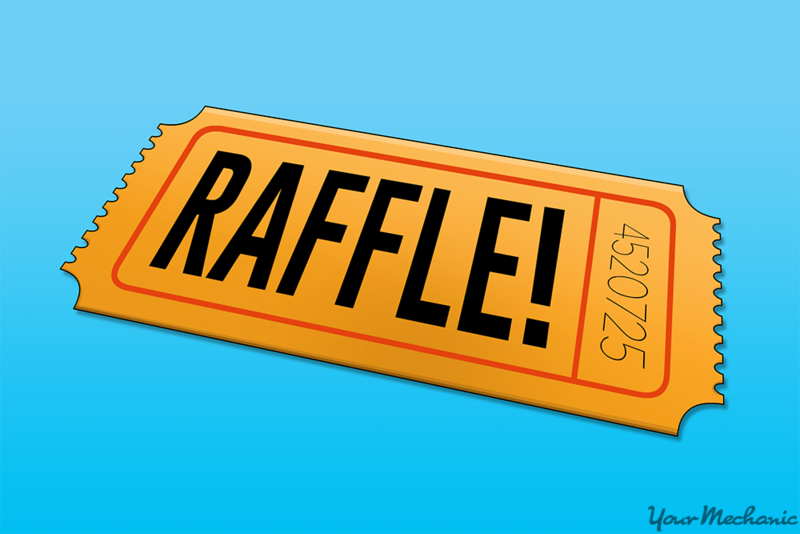 Tip: To make even more money for your charity or organization, consider selling entry tickets to the raffle drawing itself. This can also help offset the costs of any food or entertainment you provide at the big event. Step 1: Place all of the tickets in a bowl or other container big enough to hold all of them. Make sure to make a show of mixing all of the tickets together so everyone knows it is a fair drawing. Step 2: Draw raffle tickets for secondary prizes first. Start with the less-expensive prizes and build toward the drawing for the vehicle by offering prizes of ever-increasing value. Step 3: Draw the raffle ticket for the vehicle. Have a local celebrity or community representative that you have invited to the raffle do the drawing to give it more significance. Raffling off a vehicle for a good cause is a great way to support charities and organizations. When raffling off a vehicle, make sure it looks the best it can by getting it cleaned by a professional detailer.